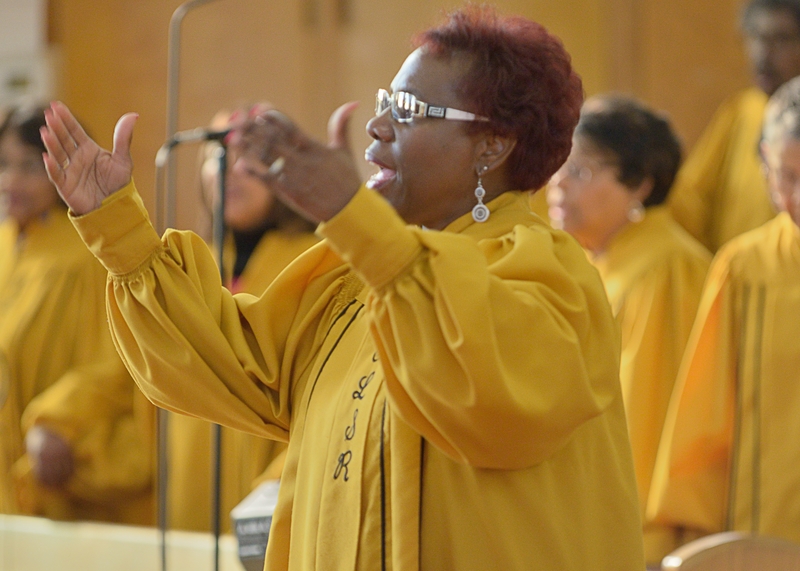 Pastoral Associate Barbara Bailey leads the choir at Our Lady and St. Rose Church. Many people in the suburbs of Johnson County may find a trip to the intersection of 8th and Quindaro in northeast Kansas City, Kansas, a little intimidating. The neighborhood is very ethnically diverse and has one of the lowest-income levels in the United States — extremely dissimilar demographics from what you find in Johnson County. And stepping into an unfamiliar environment is always intimidating. But it’s also the path to serendipity; and that’s what I experienced this last weekend when I went to Mass at Our Lady and St. Rose Church at 8th and Quindaro. I was there to cover a story on Willie Hall, a parishioner who was turning 100 that day. This is one aspect I love about working for The Leaven. It takes me on adventures I wouldn’t choose for myself. And I’ll admit, I watch the news. I was a little concerned about going into the disadvantaged inner city armed only with a notepad and expensive camera equipment. But my fears were ungrounded. It was an unassuming neighborhood, peaceful on a Sunday morning. And what a surprise I found inside this little church! The beauty of its sculptured Stations of the Cross and stained-glass windows was enchanting, but outshone by its warm and welcoming parishioners. The biggest surprise of all was the amazing OLSR Gospel Choir. Directed by Lorraine Long, this talented group knows how to praise the Lord and inspire everyone in church to join in. After Mass, when I looked through the church bulletin, I was pleased to find that Our Lady and St. Rose is hoping to form a relationship as a “Companion in Faith” with my own parish, Holy Trinity in Lenexa. Similar to the relationships our parishes have developed with sister parishes in other countries, Archbishop Naumann is encouraging parishes within the archdiocese to become Companions in Faith. According to the Companions in Faith mission statement, the communities come together, each sharing its own blessings, with special focus on spiritual, temporal, educational and social needs of parishioners in both parishes. St. Michael the Archangel, Leawood, and Our Lady of Unity, Kansas City, Kansas, are already “companion” parishes and Good Shepherd Church in Shawnee is beginning a Companions in Faith partnership with Blessed Sacrament in Kansas City, Kansas. And Our Lady and St. Rose Parish has extended an invitation to Holy Trinity parishioners to attend its 11:00 a.m. Mass on Feb. 19. I encourage my fellow parishioners, and anyone else who loves an adventure, to take advantage of this opportunity to share their faith with this loving community on the northeast side of town. You’ll be surprised at the blessing you find there.